1. Walk into the kitchen and notice there is water dripping from the ceiling. 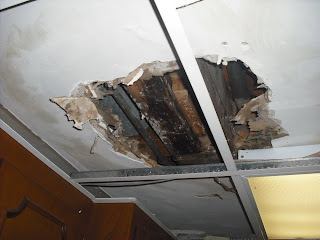 Remove the ceiling tile and find that the sheetrock is saturated and looks like it has been for some time. Break out the sheetrock and determine there is a leak in the plumbing from the bathroom upstairs. 2. While attempting to access the damage, grab a chair to stand on, step up onto it quickly and jam the top of your head into the open cupboard door above. 3. Take the garbage debris outside only to discover that your garden hose attachment froze and burst last night (yes, it snowed here this weekend) so your water has been flowing freely onto your lawn for an unknown number of hours. ouch. but if bad things do come in threes, at least you're done! Ouch! Sorry Jeff. But maybe this means you have all your drips, head butts and burst pipe problems out of the way before winter. I'll ask you this every year, so get used to it: Why again do you live in Minnesota? Ooh, that is a bad morning. I hope thigns can get fixed up pretty easily. You've just been given the Superior Scribbler Award - stop by my blog for details. That would make for a bad morning. Oh, Hon----I am so sorry. I don't know what else to say!! patkq - There you go. I like the way you think. kathy - I'm pretty sure somebody comes by every spring and flashes us with one of those memory zappers from Men in Black so we can't remember the previous winter. It's the only explanation I can think of. elizabeth - Yes, the problem wasn't as serious as it could have been. Now I just have to fix the ceiling. my daily list - Hey thanks! I majored in scribbling in kindergarten. heather - You nailed it. Unfortunately so did my head. Snow? Frozen pipes? And I thought British weather was supposed to be bad :) Did your day improve as it progressed though? Oh, I am so sorry to hear about that Jeff. I hope you got all of your headaches out of the way for at least another year. Sheesh, talk about raining and pouring. Be sure to make up for it tomorrow. Lock yourself in the bedroom with five pounds of chocolate and a good book. If there's any chocolate left over, send it to me. Yep, you've beat me for worst morning ever. All excellent reasons to live in a single-story house in California. Okay, I will officially stop bitching and moaning about how cold it was here this weekend. I can't believe you guys got snow already. What amazes me the most about this post is that you needed a chair to stand on. I would think your head hits the ceiling without one! Hope the day got better.... it couldn't have gotten worse, could it?